Pioneering workforce solutions as an integrated business partner for the 21st Century. As the proven leader of premier healthcare staffing, Cross Country Healthcare represents diversity, excellence and quality. We deliver innovative workforce solutions to an expansive range of clients, serving healthcare organizations with our specialized staffing and search divisions since 1975. 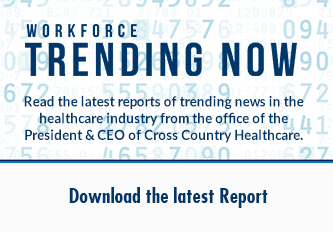 In a marketplace that is constantly facing both funding and workplace shortages, Cross Country Healthcare possesses the recruitment database and resources to effectively and efficiently deliver complete and comprehensive workforce solutions.